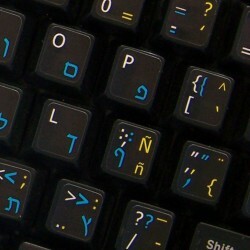 The French AZERTY - Hebrew stickers are designed and made of matte high quality, non-transparent vinyl, with all characters being printed.. 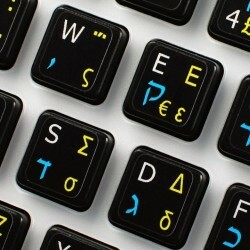 The Hebrew-Greek stickers are designed and made of matte high quality, non-transparent vinyl, with all characters being printed underneath the.. 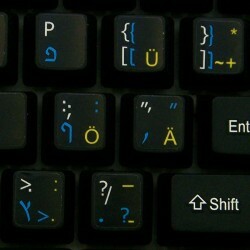 The Hebrew-Greek-English stickers are designed and made of matte high quality, non-transparent vinyl, with all characters being printed underneath.. 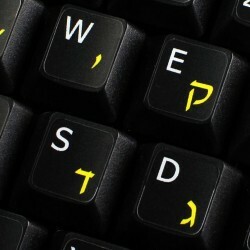 The Hebrew English stickers are designed and made of matte high quality, non-transparent vinyl, with all characters being printed underneath the.. The Hebrew Russian English stickers are designed and made of matte high quality, non-transparent vinyl, with all characters being printed.. The Spanish-Hebrew-English stickers are designed and made of matte high quality, non-transparent vinyl, with all characters being printed.. The Hebrew-German-English stickers are designed and made of matte high quality, non-transparent vinyl, with all characters being printed..